The first obstacle that many parents like you face is supporting your child to actually start and then continuing revising. I've talked about this in other episodes (Episode 22: 9 Reasons Why Your Child Isn’t Revising and What To Do About It; and, episode 37: Consistency: the key to excellent exam results). However, if they start revising but keep seeing disappointing results it's really hard to keep their motivation high and their revision plan on track. What they really need help with now is improving their exam technique, and fast. 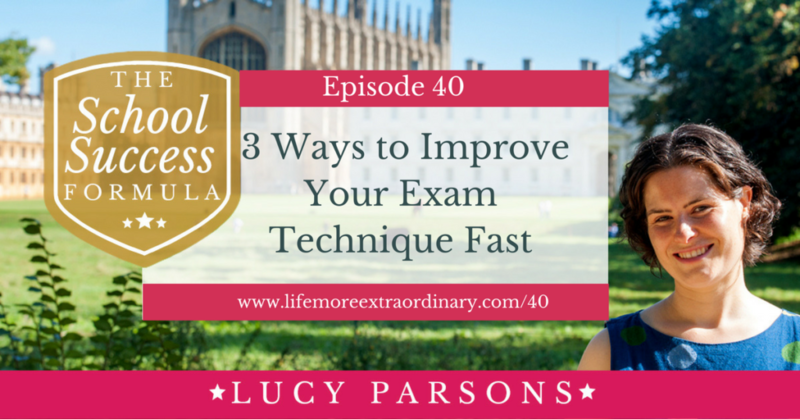 In this blog post I'm going to give you three key ways that your child can start working on their exam technique and begin to see improvements really rapidly. The most basic thing that any student needs to do well in an exam is to answer the question. I can't tell you how many times I've read a student's well-thought-out answer to a question that wasn't asked. It makes my heart sink because you can't possibly give a good grade to an excellent answer if it's not actually answering the question that was asked. This is exam technique 101. The cause of not answering the question is usually that students haven't read the question properly, and this is usually because they haven't slowed themselves down for long enough to read the question, read it again, and then possibly read it for a third time, to make sure they know what the question is asking them. One of the best ways I know to actually make sure a student is understanding the question that is being asked, and therefore giving themselves a realistic shot at actually answering the question, is by identifying the command words and content words in the question. 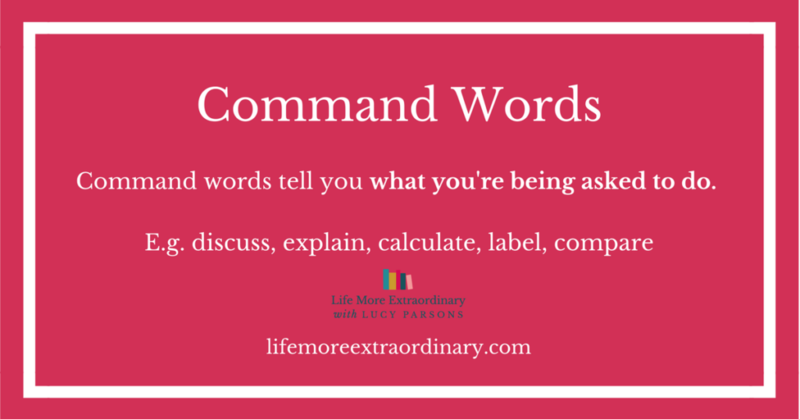 Command words are the words that tell your child what they're being asked to do. Examples include discuss, explain, calculate, label, compare etc. etc. 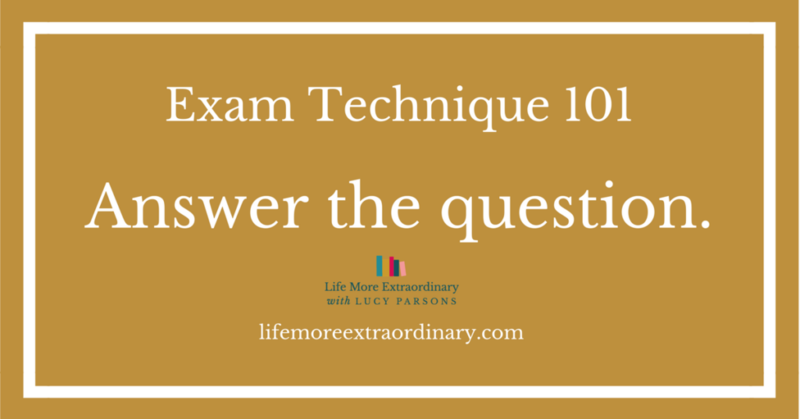 You can find a long list of command words and an explanation of what they are actually asking your child to do starting on page 107 of my book, The Ten Step Guide to Acing Every Exam You Ever Take. 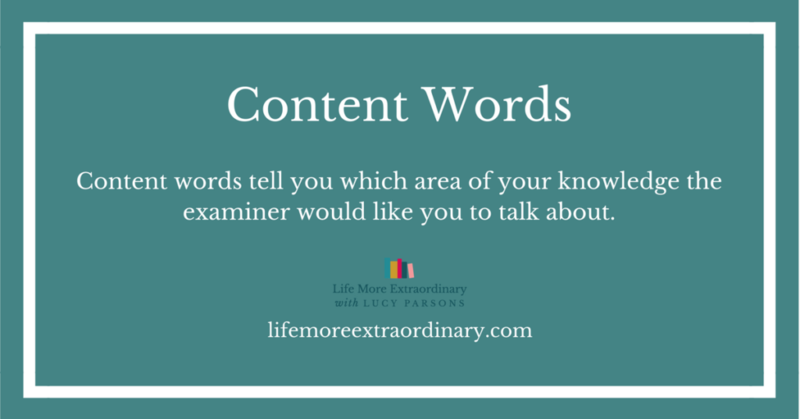 Content words, first pointed out to me by Rachael Lamb who I interviewed in episode 14 of the podcast, are the words that tell you which area of your knowledge the examiner would like you to talk about. When my coaching clients discipline themselves to take the time to identify the command words and content words in every question that they answer, they suddenly start writing better answers because they are actually answering the question that was asked. Two different types of marking are used in GCSE and A Level exams: point marking and level marking. 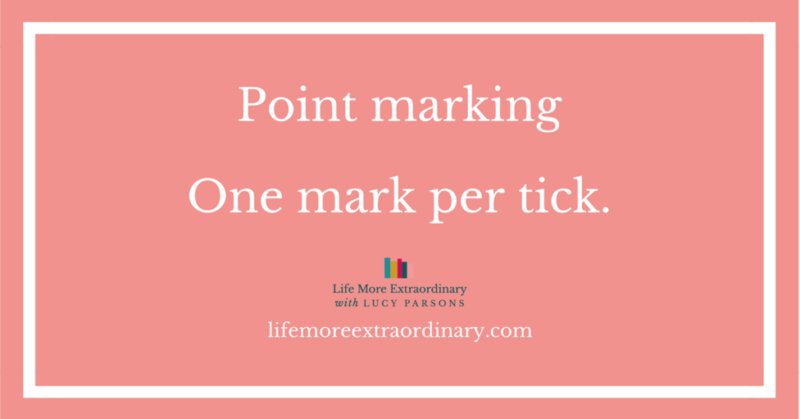 Point marking is when you effectively get a mark per tick – the examiner is just counting up the number of correct points you've made in answer to the question being asked. 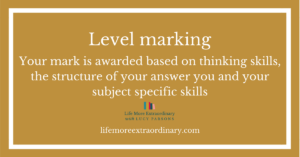 Level marking is different. It's when you're not just being judged on what you know, but on the thinking skills you're displaying, the skills (or assessment objectives) specific to that subject that you're using and the way you structure your answer. It's rare to get full marks for a level marked question if you're not aware of what the examiner is actually looking for. The way you come to understand what the examiner is really looking for in level marked questions is by doing past paper questions and marking them yourself, which I'll come on to in the next paragraph. The biggest mistake I see diligent students making is not doing past papers. Some students are scared stiff of doing past papers because they fear that their lack of knowledge will be exposed and that they will have to confront their mistakes. This is a one-way route to getting disappointing results. Students have to build past paper practice into their revision – and not only do the questions, but mark them themselves, in order to see what mistakes they're making, understand how to correct their mistakes and also understand the intricacies of level marking and what the examiner is looking for in each type of question asked. 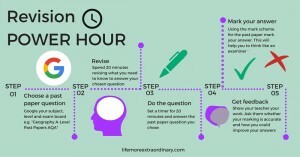 The best way I know to do past papers is revision power hours. Check out my incredibly popular blog post on the topic which breaks down how to do them. Need more help with exam technique? Click here to find out more about The Extraordinaries Club and get access to the exam technique masterclass.